I've mentioned before that my dad used to be a coin-operated arcade game distributor=a garage filled with arcade games. Friends at school thought we were the luckiest kids alive. 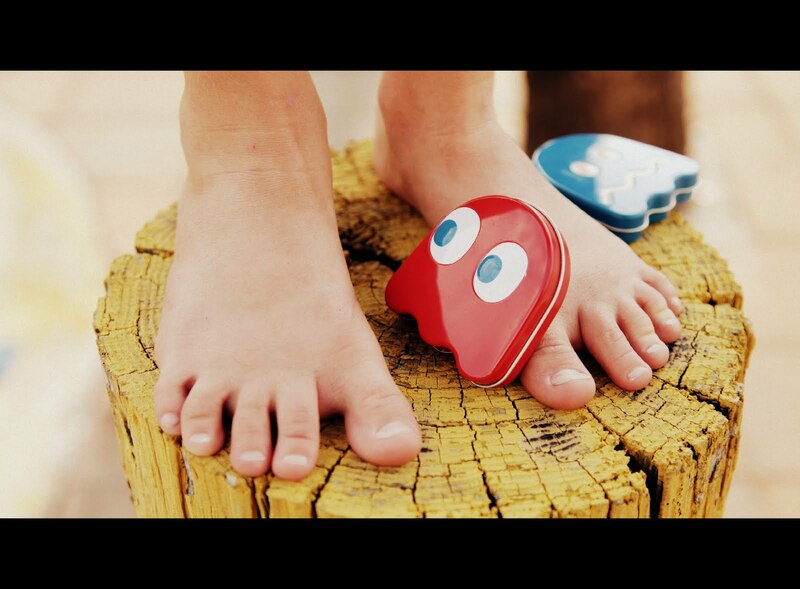 Arkanoid, Pacman, Donkey Kong, I loved them all. (Little secret--I still do!) Our Pediatric Dentist just happens to have Arkanoid and Ms. Pacman. The last time I took two of the girls, I think I might have spent a little too much time on them because, as we were checking out, the Dentist's wife leaned over the counter and slightly above a whisper told me I could drop by any time (without the kids) to play. I told her not to be surprised if I really did. No. Seriously. I rock those games. So, when Louise from I'm Feelin' Crafty contacted me about her Game Series I knew exactly what I wanted to make. This was one of those projects that has been floating around in my mind like a wayward ghost for ages ;). I had some deep blue linen in my stash that I've used for a couple of projects in the past, but there was enough to eke out a dress for Pearl. 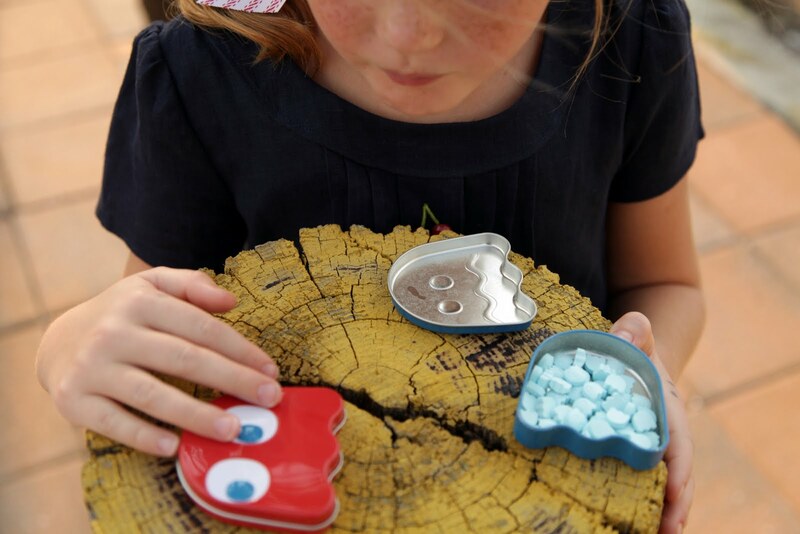 My little white buttons are probably what first inspired this project because they reminded me of the dots Ms. Pacman chomps. and then add a few little fun details that will make it more enjoyable wearing for my girls. I love teasing, playful details. I added the cherries like the floating fruit on Ms. Pacman, made out of glass Japanese beads and some dimpled glass buttons. 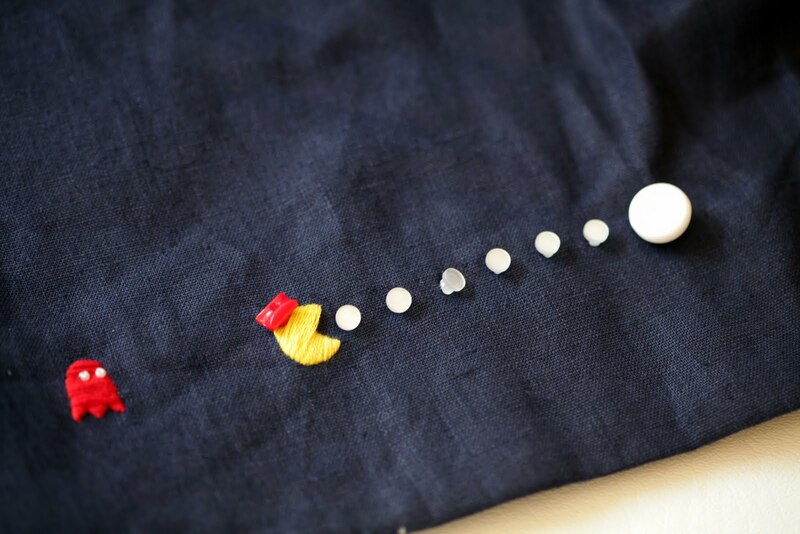 I have included a tutorial on how I did the embroidery over at I'm Feelin' Crafty where I am kicking off her whole game series, "Sew Ready to Play". You'll want to tune in! this is so awesome! Flashbacks to my childhood today in a big way! First with Simple Simon's ice cream clown treat - and now this. First of all, Arkanoid is the best game ever! Also, I love this dress! The new Oliver + S patterns are just fantastic. Have you seen her adult patterns in the newest Simplicity catalog? They're called Lisette and they're awesome as well! Jess-Yes, I'm familiar with Lisette, but it seems I've been pregnant since they came out, so Ive yet to try my hand at them. That is so cute! I wish I had, had a dress like that. She looks adorable! Clever, beautiful, fun! What young girl would not LOVE this dress?! I love this dress! This blue linen is fantastic and this pattern is great! How does Pearl like the fit across the back? If you were designing it yourself, would you have put the pintuck pleats down from the yoke, or gone with an inverted pleat either side of centre, or a different technique to allow movement across the back? Wonder how that would have sat/resettled in between being stretched open during wear? 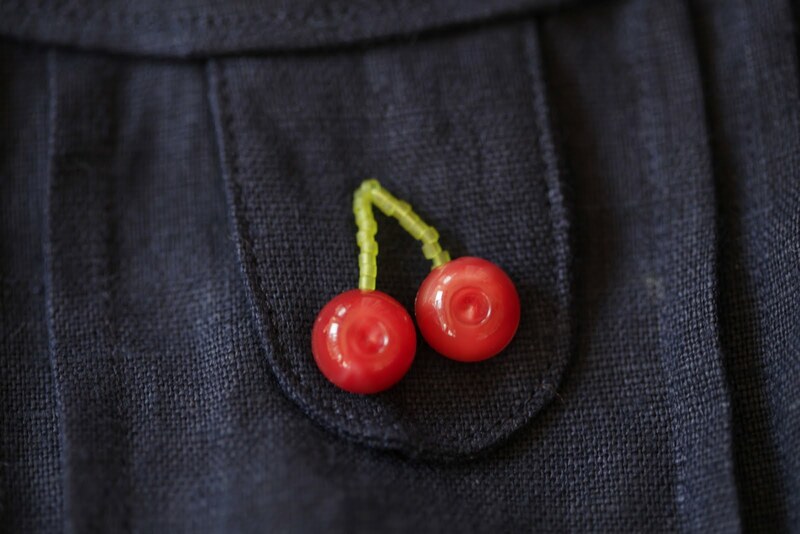 One more time - <3 the :> cherries! Love it!! Waka waka waka waka! I just love all the beautiful details! Another lovely dress for your girls! That's super awesome. You are filled to the brim with creativity--one of my favorite things about you Katy! Elles sont magnifiques, ta fille et sa robe !!! Bravo ! I love little details that you have to look closely to find...an awesome Ms. Pacman dress without some yucky commercially-printed-licensed-crazy fabric! Just beautiful. As always you have made popular culture classic and timeless. Im guessing no baby yet...my last one (born in July) with a midwife was 3 1/2 weeks late. Not that Im wishing that on anyone, but at least I know, You can do this!!! Hang in there! P.s. Your craft room is gorgeous!!! That's something else! Very fun! Those details are just fantastic! Love the dress. 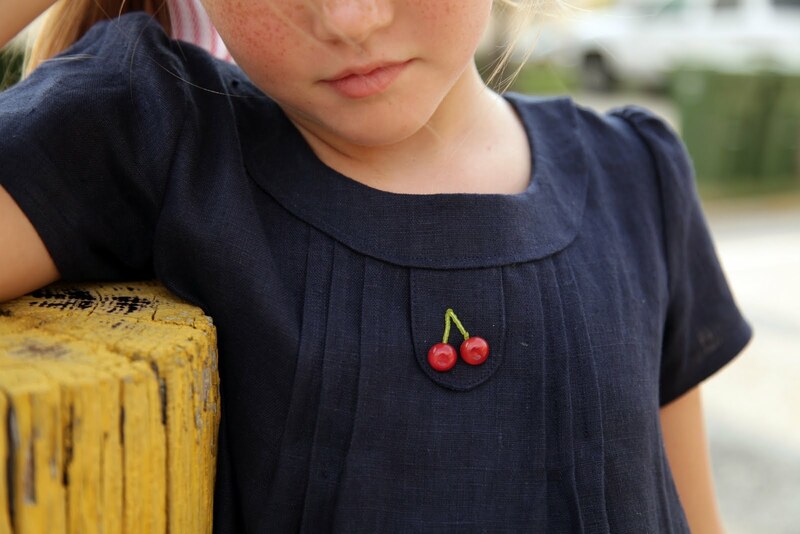 I used a similar deep blue linen on a skirt for my daughter in the past - it's my favorite. It moves really nicely. Checking back often for baby news! Best wishes for a happy, peaceful delivery! 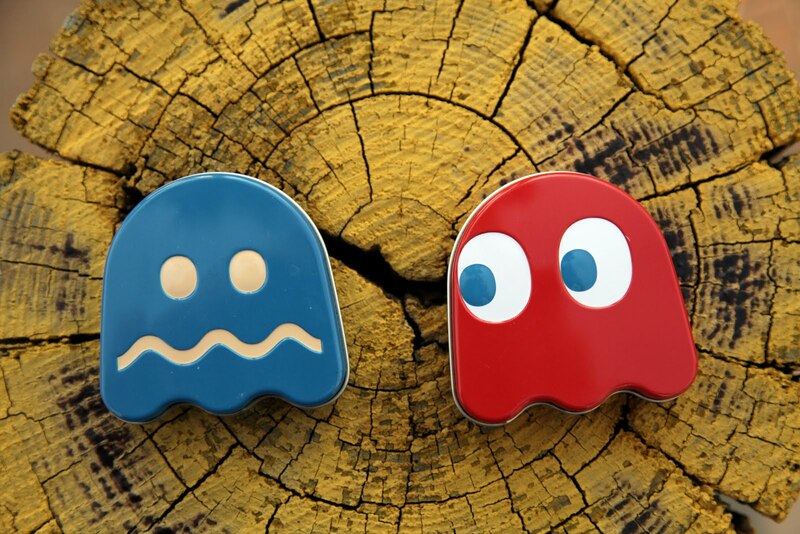 Just came across this when searching for ideas for a Pac-Man birthday party. 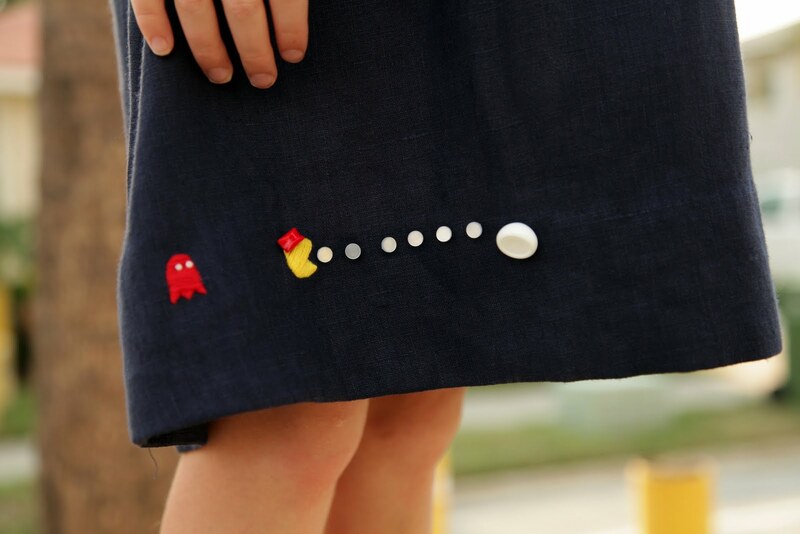 I love how you combined a classic, beautiful dress with very subtle fun Pac-Man elements! So cool. Your daughter is very lucky!